myReviewer.com - Review - Free your digital music! I’ve got a lot of music. I’ve always had a lot of music. From collecting 12” singles as a teenager, to tapes, CDs, DVDs and now downloads (MP3s, AAC, OGG, FLAC, WAV and any other weird and wonderful formats that people publish in). And I've had lots of different devices for playing music in that time too. From tape recorders to a record player/tape deck combo, on to a midi hifi system with six CD changer, turntable, tuner and twin tape decks, which saw 12 or so years of hard service (and still works today, although it languishes in the loft). The reason for it retiring was the arrival of my first home cinema amp which has become the main supplier of audio in the home. The rear speakers have changed once since then, as has the original amp which developed a fault after 10 years and was replaced. The arrival of the home cinema system also meant the arrival of DVDs and Blu-rays and with only limited storage space something had to give. So lots of CDs have entered storage in the loft and digital music has taken over. Car stereos play MP3s now so no need for lots of CDs for the car either. However, I haven't really found the right solution for digital music for the lounge. Until now. 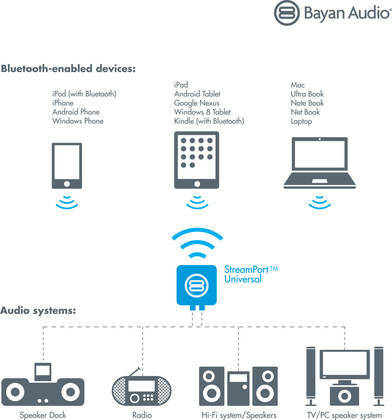 Step forward the Bayan StreamPort Universal, which enables you to stream audio from any Bluetooth A2DP-compatible device (Bluetooth 4.0 Smart technology with A2DP V1.2), using NFC auto-pairing and Secure Simple Pairing, as well as being one of the world’s first wireless audio adapters to feature the aptX audio codec. In about a minute (plus a few more minutes to navigate my own complex web of audio cabling) it was installed and up and running. 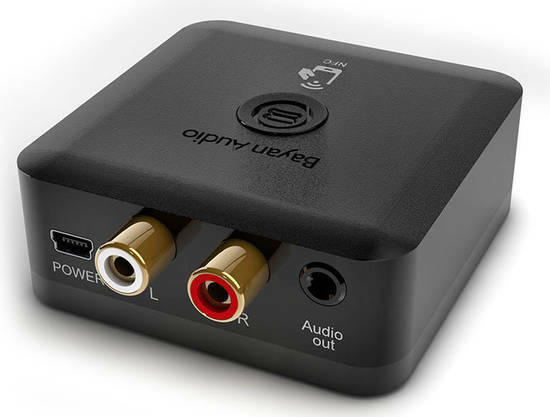 Take it out of the box, connect it to some form of amp or speaker (it has RCA or 3.5mm jack options) and switch on. It is USB powered (which also increases its portability). Once switched on, you pair your device with it via Bluetooth and in another 10 seconds or so you are ready to stream audio. And then you spend a lot of time streaming audio, wandering around, testing the range and finding that you can walk around the house and even into the garden without interrupting the music. And then you pair your laptop up with it (it will remember the last three devices paired without any need to "re-pair"). Now you can play random YouTube videos via your music system. So you go off on a nostalgic trip through 1990s "toy town rave" and laugh as you listen to "Trip to Trumpton", "Sesame's Treet" etc. And then "Roobarb and Custard (rave version)" becomes a tribute to Richard Briers who recently passed. It is brilliant. The sound quality is very good (dependent on your source audio of course). Bayan recommends 320Kbps as your bit rate, but 192Kbps seems to be just fine. Comparing a streamed digital copy of Beverley Knight's "Soul UK" against the CD through the same amp produces very similar results, and it sounds great. If you've been searching for a solution to free your digital music, this is it. Combine this with a smartphone, and combine that with a Kingston Wi-drive (which allows you to play media files stored on it via wireless) and you can have your entire music collection available at the tap of a few screens. An excellent little gadget, and it will definitely be in my top 10 round up at the end of the year. 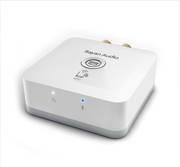 It’s easy to set up, easy to use, and can solve your digital music conundrum in seconds.